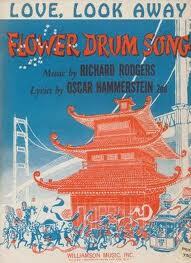 “Love Look Away” is from the Rodgers and Hammerstein musical Flower Drum Song. While the score is quite beautiful, Flower Drum Song is seldom performed today due to concerns regarding Asian-American stereotypes. Love Look Away was recorded on November 2, 1958 and released in 1958 as a single. The same recording was used on the 1962 album Mr. Broadway: Tony’s Greatest Broadway Hits. It was arranged by Glenn Osser. “Love Look Away” was recorded live on November 28, 1958, but was not released until 2011 on Rarities, Outtakes & Other Delights, Vol. 1, from the Tony Bennett Complete Collection. “Love Look Away” was recorded live at Tony Bennett’s concert at Carnegie Hall on June 9, 1962 and was initially released in 1962 on the album Tony Bennett at Carnegie Hall. Ralph Sharon arranged the song.